As a new blogger, I am participating in my first It’s Monday! What Are You Reading? #IMWAYR is a community of bloggers who link up to share what they are reading. Kellee Moye of Unleashing Readers and Jen Vincent of Teach Mentor Texts decided to give it a #kidlit focus and encourage everyone who participates to visit at least 3 of the other #kidlit book bloggers that link up and leave comments for them. This beautifully illustrated collection of poetry celebrates reading. As I read each poem, I was nostalgically reminded me of my own reading journey from learning how to read, anxiously waiting for my Cricket magazine to appear in my mailbox, being emotionally affected by characters in books as well as being transported to different times and places. I can’t wait to share these poems with students and teachers at my school. Read Read Read will be released on September 17, 2017 and right now, it is $5.61 off on Amazon. Great day to pre-order! A sincere thank you to the author, Amy Ludwig Vanderwater for providing my #bookexcursion with an advanced reader copy of Read Read Read. Prepare to be spooked! Tessa moves from sunny and sandy Florida to rainy and cold Chicago. She is not happy about starting over at a new school and desperately misses her best friend Rachel. Not long after her family moves into their new home, Tessa notices strange things happening. Could her house really be haunted? With the help of new friends, Tessa begins to uncover a mystery involving a young girl who died many, many years ago. Highly recommend this #mglit book for its seamlessly blending of suspense, humor and most importantly the power of friendship. The book trailer can be viewed here. The Peculiar Incident of Shady Street is being released on October 10, 2017 so pre-order your copy now. Thank you to the author, Lindsay Currie, the publisher, Simon and Schuster Children’s and NetGalley, for providing me with an advanced reader copy of Peculiar Incident on Shady Street. 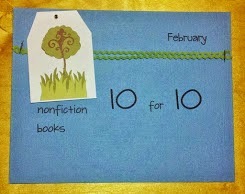 Thanks to my fellow #bookexcursion member and Literacy on the Mind blogger Dr. Lisa Maucione for this recommendation. Reading does not come easy to Madeline and she is yearning for a gold star to prove to herself that she is a good reader. 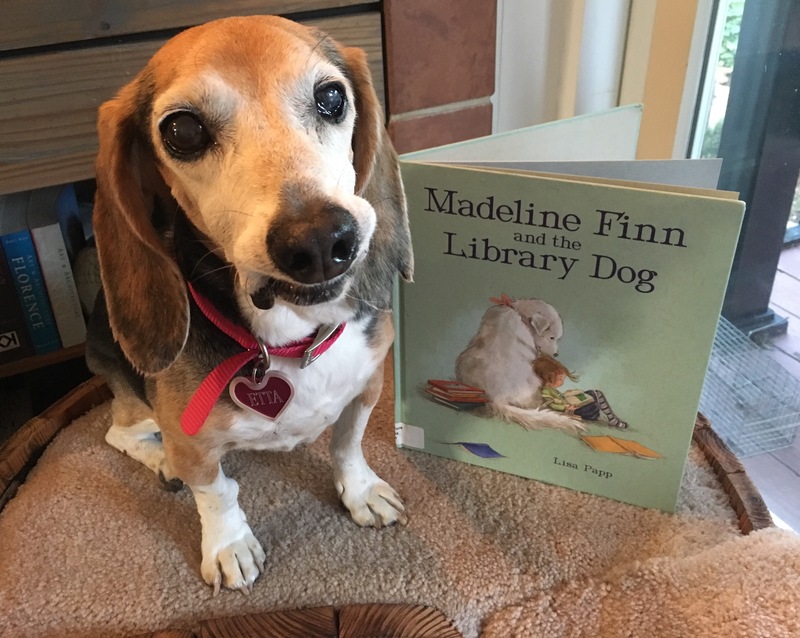 With the help of her concerned mom, a caring librarian, and a patient dog named Bonnie, Madeline gains her confidence. 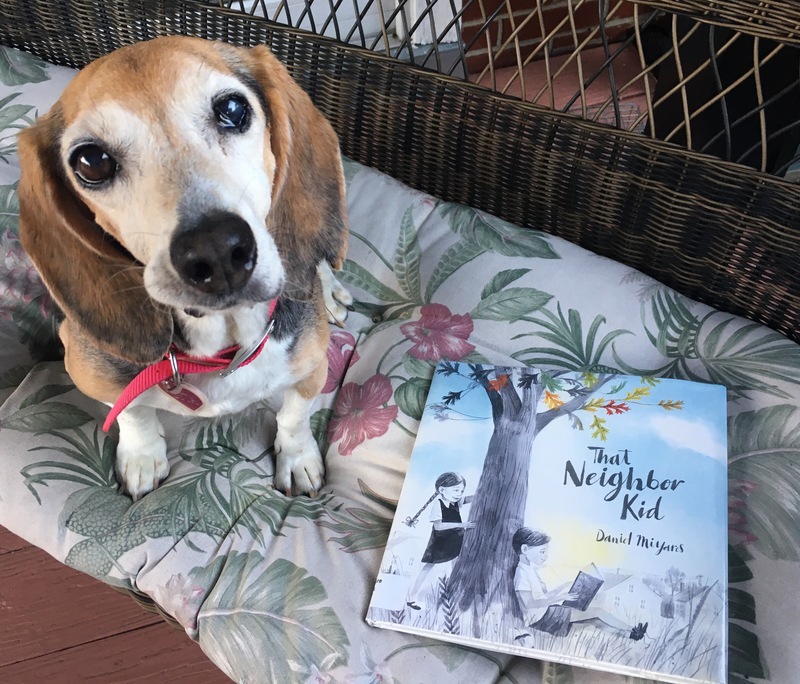 This wordless picture book was recommended by Jillian Heise who shared it on one of her #pd10for10 lists. A girl spys her new neighbor in his yard reading. Her curiosity leads her to helping him with a project which cements their friendship. A child struggles with finding the best place to read. The illustrations beautifully convey the child’s difficulty with all the potential reading spots. But is the location really crucial? Read this book to find out what is most important about reading. Etta and I thank you for reading! Have a great week! Glad you joined the It’s Monday! What Are You Reading? community. I have to get a copy of That Neighbor Kid. It sounds great. Glad you read Madeline Finn! I am just starting The Peculiar Incident. Thank you for your support and advice! Can’t wait to hear your thoughts on Peculiar Incident. I just couldn’t put it down! Love your blog! Your dog is very cute! I just read A Place to Read this afternoon. I thought it would be a great book to read at the beginning of the school year as kids are settling in to their reading routines at home and at school. 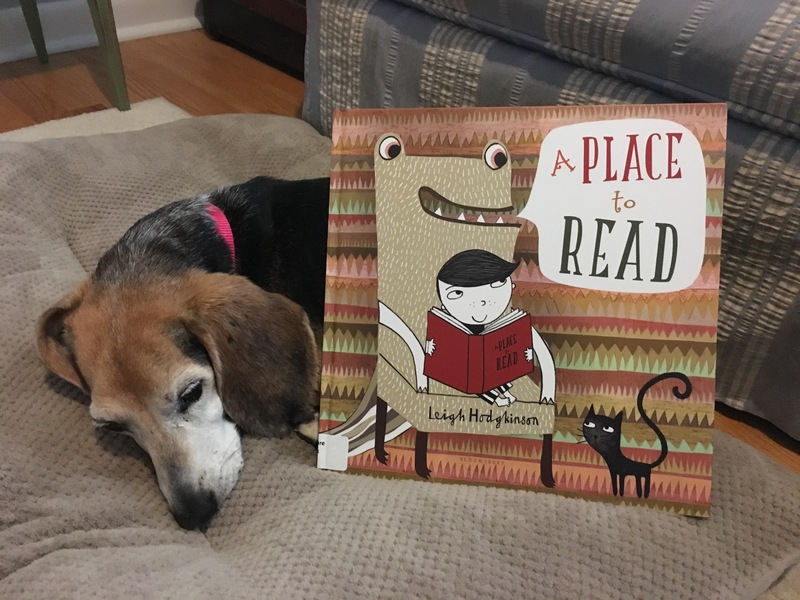 Kids might even be inspired to write about their own perfect reading spots! Thanks for sharing and have a wonderful week! Your recent blog posts have given me some new reads so thank you! I want to get A Place to Read. It sounds fun. I really enjoyed That Neighbor Kid. I think it offers a lot for discussion. Glad to have you in the blogging world. Welcome! Thanks so much for the warm welcome! I love books about reading and the illustrations are wonderful in A Place to Read! The dog! Ah, I just love this!!! Thank you! 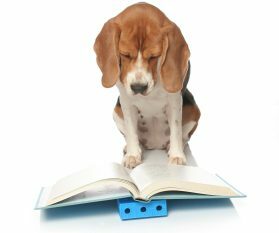 I thought it was the best way to combine my love for both beagles and books! 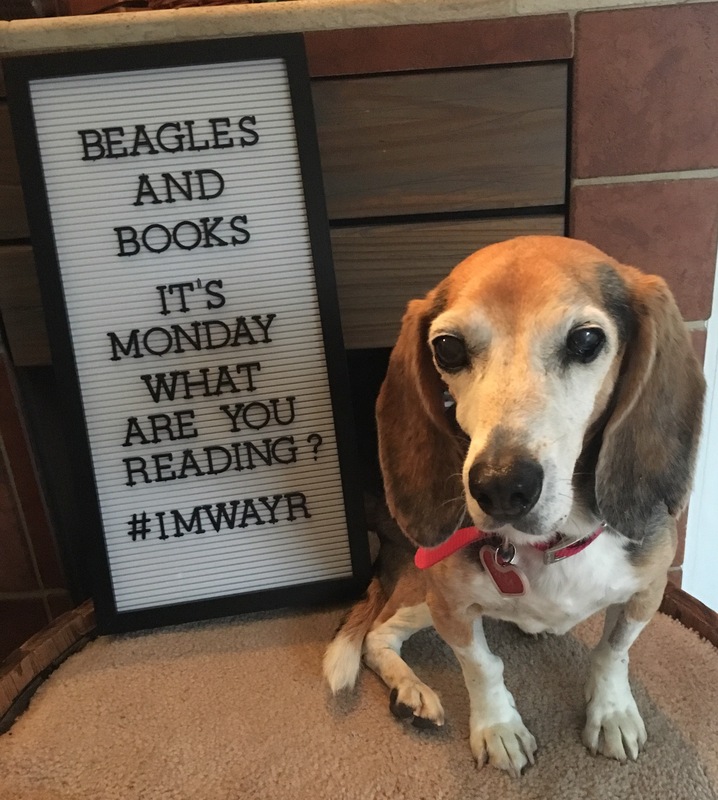 Looking forward to being part of the #IMWAYR community! Your beagles are adorable! I love Daniel Miyares so I’m looking forward to That Neighbor Kid! Etta & Annie thank you for your compliment! That Neighbor Kid was my first Daniel Miyares’ book. Definitely will read more of his books. Thanks so much for reading! Welcome to blogging! I love the Monday link ups 🙂 Great books – Shady Street and Read Read Read are favorites! Can’t wait to share them this year! Thanks for the warm welcome! Excited to share and get new book recommendations! I love your photos! I have a golden retriever and would love to pose her for some pics (my 3 yr old and 18mo old too for that matter) but so far no luck lol. But thanks for the new additions to my kids’ TBR 🙂 We are definitely going to check them out! Thanks so much! Etta is pretty tolerant of me but it may take a few shots before I get a good one. I will def check out your blog too! Thank you so much. Etta has been a good sport and it’s a lot of fun! I can’t wait to get my hands on Read Read Read again. It’s a favorite with #bookexcursion! I appreciate your kind words about Annie. It’s sad that she was not in our lives longer, but her impact was immeasurable.